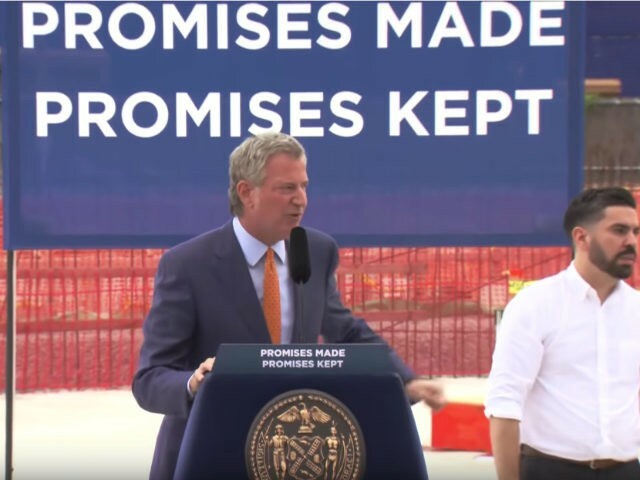 New York Mayor Bill de Blasio’s “Promises Made, Promises Kept” sign at a school groundbreaking ceremony Monday looked like it came straight out of a President Donald Trump rally. A big blue sign emblazoned with large white letters reading “Promises Made, Promises Kept” stood prominently behind de Blasio as he addressed attendees at a groundbreaking to construct a 1,000-seat East New York school, according to the New York Post. The New York Daily News posted a photo of de Blasio speaking in front of the sign. The Trump slogan-invoking sign was curious given de Blasio’s strident criticism of President Trump. In July 2017, de Blasio skipped an NYPD swearing-in ceremony and, just a day after an officer was killed in the Bronx, flew to Germany to protest the president and other world leaders at the G20 summit, where protests turned violent. 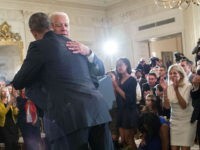 Donald J. Trump for President posted a “Promises Made, Promises Kept” video in September 2017, highlighting the president’s executive order expanding vocational training. Another video employing that theme and phrase was posted last year to Trump’s Facebook account. The Trump campaign has gone so far as to establish promiseskept.com, touting the president’s accomplishments on a number of issues. Trump held an Indiana campaign rally in May this year, standing squarely between two blue signs reading “Promises Made” and “Promises Kept.” Signs with the same message appeared in March at a rally in Pennsylvania. Trump displayed double the signs at a Montana rally in July, one set flanking his podium and a giant set flanking a massive American flag behind the stage. The school at which de Blasio spoke at the groundbreaking is located in a vacant lot owned by the city, according to the report that cited the city, and is slated to open in 2020.